Artist Andrew H. Shirley’s “Anything Helps 6”, a quasi-foyer of corrugated metal and graffitied plywood leads the way into the Holland Project’s Serva-Pool space, where Shirley’s existential short film installation Wastedland 2 is on display. You need to duck your head to enter the structure leading into the immersive, near abandoned-feeling film installation. Outside Serva-Pool, “The Beginning If Not The End”, a vaguely aquatic, tentacle sprouting, pineapple shaped sculpture by William Thomas Porter and UFO, is explored by visitors. Installation-goers take turns peeking inside the sculpture’s hollow body or spinning a few of the sculpture’s 37 rotating eyes. Inside Serva-Pool, a pile of rusted spray paint cans, paint buckets, and fire hydrants extends up a wall. A birthday party-esque banner created by Greg Henderson reading “This Wasted Land” extends out of a chimney and up to the ceiling like an ominous procession of self-aware smoke. “This Wasted Land”’s chimney sits in a shopping cart pushed by a mannequin dressed in the costume of Wolftits, a character in the film created by Briana Barber. The entire exhibit feels found, as if you were walking through an abandoned building in the desert only to discover each of these art pieces sitting in an empty room, waiting to be discovered. Each piece blends into Serva-Pool as if it’s always been there. Exploring the exhibit is akin to the existential journey that Wastedland 2’s characters take. Viewing each piece before the screening prompts visitors to question the exhibit’s message, the pieces’ relationships to one another, and, of course, the visitors’ place in the exhibit. Shirley aims to show that graffiti art is a three dimensional thing, as his show naturally immerses viewers in every facet of its own existence. He says that that is one of the meaningful concepts behind graffiti art; placing something in public view to be seen by as many people as possible, to perhaps make people think. Visitors of the exhibit soon found themselves seated at two rows of church pews in front of a makeshift projector screen made of a whitewashed piece of wood hung from the ceiling by chains. The pews and the people in them were arranged in close quarters like a group of some ancient species gathered around a campfire to tell stories, to possibly offer each other insight to our individual and collective existences. The film follows the existential quest of the self-made characters of the Brooklyn-based 907 Graffiti Crew members. Each masked character (Wolftits, Amoeba, and Smells) finds each other while searching for the meaning and source behind the prominent, characterized graffiti of UFO. Exploring abandoned buildings and mountain ranges, the characters find themselves searching for something much greater than themselves. The tireless exclamation and motif of “What’s the point?”, a question we have all asked ourselves, drives the characters on their odyssey. Shirley says that each character represents common stereotypes of graffiti artists or “vandals”. The characters of Wolftits, Amoeba, and Smells, as well as their costumes, were crafted by graffiti artists in reflection of their spirit animal identities. Throughout the film, the characters path to existential discovery is frequently blocked by social expectations, specifically as Shirley said “your need for approval from colleagues, friends and family destroys your ability to think freely”. Similarly, getting caught up in drugs prolongs the anti-heroes cycle even further. The audience at the screening laughed, realizing the extent of this satirical, but all too real conflict. 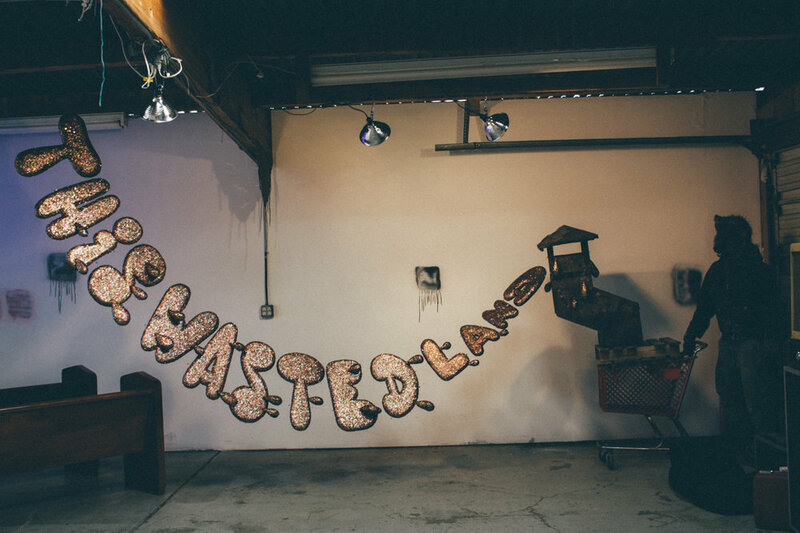 Ultimately, Wastedland 2 and the installation that surrounds it aims to make viewers think a bit more about their world and their individual places in it. The installation as a whole seems to be living like us, like the representative characters in the film. The traveling exhibition molds itself around each venue it visits, uniquely evolving as it sees fit, attempting to take this existential journey and answer these questions for itself. Find out (or, at least, attempt to find out) the meaning of your existence at Wastedland 2, up at The Holland Project until May 27. More info for Wastedland 2. More info for The Holland Project.